Eco returns to familiar themes of deception and conspiracy in this fast-moving story about government corruption and media manipulation. Colonna, a hack writer, is invited to join a motley group funded by a mysterious high powered backer that is creating mock newspapers exposing past corruption. To what use these “zeros” will be used is never revealed, but he is soon drawn into a deadly web of clues that lead from Mussolini to the Vatican to the modern Italian government. Those who enjoy conspiracy theories and skewering the powerful will read this book with delight. A newspaper committed to blackmail and mud slinging, rather than reporting the news. A paranoid editor, walking through the streets of Milan, reconstructing fifty years of history against the backdrop of a plot involving the cadaver of Mussolini's double. The murder of Pope John Paul I, the CIA, red terrorists handled by secret services, twenty years of bloodshed, and events that seem outlandish until the BBC proves them true. A fragile love story between two born losers, a failed ghost writer, and a vulnerable girl, who specializes in celebrity gossip yet cries over the second movement of Beethoven’s Seventh. And then a dead body that suddenly appears in a back alley in Milan. 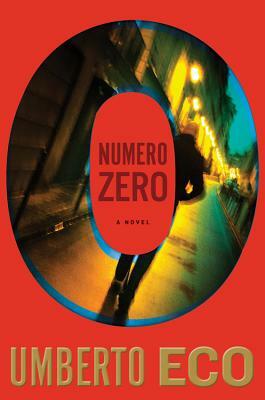 Set in 1992 and foreshadowing the mysteries and follies of the following twenty years, Numero Zero is a scintillating take on our times from the best-selling author of The Name of the Rose and Foucault's Pendulum. One of Vulture's "7 Books You Need to Read this November"
Included on the Los Angeles Times's "Holiday Books Roundup"
One of Bloomberg Business's "Eight Books for Your Holiday Reading"
One of the Sun Herald's "Ten noteworthy fiction and nonfiction titles on the way"